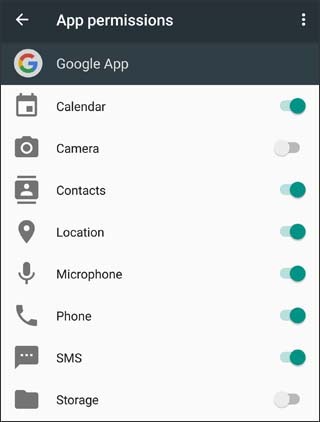 Downloaded apps designed for Android 6.0 (Marshmallow) and up only ask for permission the first time you use a feature rather than asking for permissions out of context. Turning off certain permissions may result in basic features no longer working as intended. Here's how to check what software version your device is running. These instructions only apply to the default Home screen layout. For software version 7.1.1 or earlier, tap App manager (upper-right). If system apps aren't visible, tap the Menu icon (upper-right) > Show system apps. If available, tap Permissions (App settings section). Select available permissions (e.g., Camera, Contacts, Location, etc.) to turn on or off . If prompted, review the message then tap CANCEL or DENY.